It feels good to be back in my sewing room again! School is out, and summer is in! We had a fabulous family vacation to Orlando this month. Health-wise, I've had a bunch of tests done, and am ready for my surgery this week. This is the first I've spent much time in my sewing room all month - and this month is about up! I've been following the EQ7 Summer Series. June is Month 2 and uses EQ7's PatchDraw functionality with paper foundation piecing to sew the block together. I've never done foundation piecing before, so I thought I would just rotary-cut the pieces and stitch them together. Once I read the instructions, that called for very odd angles, I decided that rotary cutting wasn't going to happen, and I should learn foundation piecing and give it a try. On the Fons & Porter's Love of Quilting website, I found a video that demonstrates the foundation paper piecing instructions. Perfect! I had this video playing and pausing a few times as I stitched my first pieces. Having never done this technique before, I can see why people like it for odd angles - the points come out perfect! First thing to do is print the pattern on thin tear-away paper. I picked some up foundation paper at my local JoAnn store. The Print function of EQ7 allows you to print your block for foundation piecing. If you want to try this pattern yourself, you can download and print my foundation pattern here. Following the instructions on the video, I started stitching the fabric pieces to the paper foundation pieces. Foundation piecing is also know as "flip and fold", because you do a lot of that to stitch these pieces together. It is more time consuming, but it works well for these odd shapes and angles. 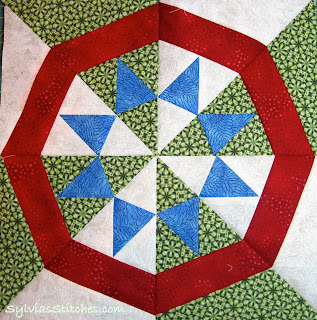 After stitching each of the block segments, stitch them together to form the block. Remove the foundation paper after the block is complete. 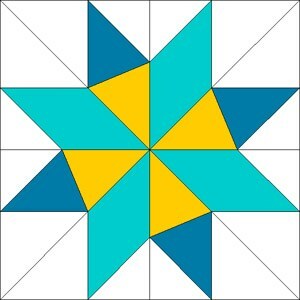 This month's mini lesson was using the Pieced PatchDraw technique to create the Eight Point Star. You can find the mini-lesson here. Here is the lesson's original block, and my EQ7 version. Nice block! I haven't gotten to this lesson yet. You'll enjoy it. It was something new for me to try. Love your blocks. I still have to post mine. I'll be doing that later today. Best of luck on your surgery. I'll be thinking of you and sending prayers your way! Your block is really lovely and it is good to see the other you have drawn - I haven't done the midmonth lessons yet. Best wshes for the surgery. The block turned out beautifully! I'm still trying to get the hang of paper piecing since when I flip I usually find that I cut out my fabric backwards and it doesn't fit correctly. Makes me feel dyslexic but I'll get back to it eventually. I'm a new quilter and have never used EQ. Can you do a lot with it and is it worth the investment? I found I cut several pieces backwards. I also stitched an entire segment on the wrong side of the paper, so it was all backwards. Takes some getting used to I guess. The software is very powerful. It can do an enormous amount for designing and creating quilts and blocks. My favorite part is just to play with the colors and fabrics. I love being able to audition different colors and see the entire quilt in the software before stitching any of it. The software sounds like a great way to plan what you're going to do. The pieces look great. Nice block! I wish I was a quilter! Thanks for sharing at Submarine Sunday! I read that you had your surgery and I hope your road to recovery is a smooth one. 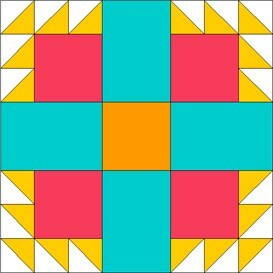 Looking for others who share my love of paper (foundation) piecing! You are my new hero! I recently (in August) found out that I have cancer. I am featuring you on my blog http://bigcitybackwoods.blogspot.com/ Thanks for blogging!